A Comprehensive Blueprint for Residential Appraisal Reform - And the Winner Is? GUEST AUTHOR: Patrick Egger is a Certified General Appraiser located in Las Vegas, NV. He teaches continuing education classes on the housing market, appraisal issues for real estate agents and appraisers. He can be reached at lvreqa@cox.net Look for the Outside The Boxes category for a collection of Patrick's articles on Appraisal Scoop! For years, Joan Trice via her Collateral Risk Network has promoted the concept of improving the appraisal process. Recently, Joan participated in a whitepaper with the National Association of Homebuilders (NAHB) entitled “A Comprehensive Blueprint for Residential Appraisal Reform”. The other day in the Appraisal Buzz, Joan invited appraisers to participate in “improving the appraisal process”. She wants our thoughts, ideas and anything we feel will make a difference and improve the appraisal process. Regardless of whether or not you agree, or disagree with her direction, you have to respect her effort. Leading means doing what needs to be done and Joan is leading. She took time and made the effort to assemble movers and shakers along with “inside the beltway folks” that are in a position to reshape the appraisal process. She also has the attention of the NAHB, and the “Collateral Risk Network”, a 300 person “members only” group of chief appraisers, regulators and industry experts, who (according to the article) “are focused on resolving the many challenges facing our profession”. To that end, I wanted to make some observations and give Joan some thoughts on the appraisal process and ways I think we could make it more effective for appraisers and those that rely on appraisal services. I hope that each of you will do the same. In my opinion, the form and the process could be improved. However, I do not believe it is the form or the process that stands as an impediment to a healthy housing market. When you examine what is wrong with housing and the system, changing the appraisal form is not going to fix the problem. While USPAP has been adopted by the users of appraisal services, its underlying tenets and fundamentals have not been intergraded into the lending system that appraisals support or into the mindsets of those that use or rely on appraisal services. Therein is the problem. We are required to develop opinions “objectively” within USPAP compliance. At the same time, those wanting to “make a deal”, often want us to view the value opinion from outside USPAP or lending guidelines. When we do not, we are the problem and we are the ones impeding “housing’s recovery”. same, regardless of the value opinion. We have every incentive to make the deal and avoid the consequences. On the other hand, builder’s, lenders and other market participants, have skin in the game. They do not earn a commission or a profit if the deal does not close. When the deal is at risk of not closing, due to the value not being there, the debate ensues. Is it a fair debate, with all parties trying to find the right value for the subject or is it a little one-sided, with some of the participants promoting a value opinion via “their comparables” that, “believe it or not”, supports the deal and a commission earned or profit realized? Personally, I think USPAP, market value and a long list of appraisal related issues (including the forms), better training, accountability, etc., should be addressed. However, none of this will matter unless we change the system. As long as market participants have a financial incentive to close the deal, any impediment to closing the deal, will be considered counter-productive and will come under attack. We have changed the form and the appraisal process many times over my 40+/- years in the business. Tell me, what has changed when it comes to users of appraisal services and those that rely on the appraisal, when the appraisal does not close the deal? Over the past five plus years, lenders, homebuilders, agents and secondary market investors went out of business and homebuyers lost their homes, when loans did not perform and the effects rippled through our economy. Ask a few simple questions to these same individuals and businesses. The appraisal process is not perfect and nor are the appraisers. I have taught nationwide and met 1,000’s of appraisers. Generally, they are good people who do not know what they do not know. This we can fix with better training. On the other hand, you cannot fix an “incentive based” housing market with a new appraisal form. definition of market value and a set of standards and criteria that must be followed to determine what market value is, the appraisal profession under lending guidelines. disagree that “changing the appraisal process or forms” will solve the problem or that it is “one step” towards a possible solution. This country depends on housing. Housing and its related industries are a considerable contribution to the GDP of the US. Over the past decade, we witnessed firsthand, the importance of housing and the financial systems and related industries that support it and our economy. Everyone was made acutely aware of what happens to the economy when you disregard the measures in place to prevent pressure and unfair advantages. Market participants want a better “appraisal process” and one that is transparent. I for one agree that it should be and they should have it. To that end, we do not need to change the appraisal process or the forms. We simply need to have the participants adopt the same rules we have. We need all of “housings participants” to play by the same rules, to be governed by the same principles and subject to the same consequences. We can start by having the National Association of Home Builders, the National Association of Realtors, and others adopt a modified version of USPAP or Dodd Frank that incorporates many value related principles and the same definitions (including value and how it is determined), that we have. When builders and agents set the price, those prices should be supportable as market value, using the same criteria we have to. Those involved with the sale (that depends on financing), refuse to recognize the rules adopted (USPAP and Appraisal Guidelines) by those that control that same financing. anyone violating its principles and provisions are now subject to the same consequences. to us equally, there would no longer be an “appraisal problem”. Housing is multi-sided, complex and vital to the economy. Housing depends and financing and financing depends on a transparent and verifiable appraisal process. At the same time, we cannot have one part of housing subject to rules and consequences the other participants are not. Our tax dollars support Fannie Mae, Freddie Mac, HUD, VA, etc. If we are taking the risks of funding housing, we need to minimize the opportunity for housing to derail, a result of, “unintended consequences”. If tax dollars support housing, there should be transparency for the process, the data that supports the process and the rules. Remove the privacy laws and give appraisers access to the data in places where they do not have it. Share knowledge and common goals and all ships rise with the tide. My suggestion, invite the homebuilders and agents (and anyone else with skin in the game) to be a part of changing the appraisal process. Give them a say and have them take the pledge to promote and support whatever comes out of this process and to force Congress to modify Dodd Frank and make it the law of the land, applicable to all of housing’s “market participants”, equally. Housing’s health is vital to the US economy. Each of us, have a stake in seeing a vibrant housing market. To that end, there are no acceptable reasons for any market participant to have an advantage or any other one to be disadvantaged, as appraisers have been for many years. Homebuilders and other participants make valid observations. Appraisals often are not consistent and at times, this will cost the builder or consumer. At the same time, it is easy to point a finger from the stands and tell others what must be done, when you do not have to follow the same rules and you are not subject to the same consequences. Several years ago, in response to the HVCC, Dave Biggers and Alamode collected more than 30,000 signatures in support of sensible changes (as opposed to what was on the table at the time) and forwarded them to Fannie Mae, Freddie Mac, HUD and others. This effort had an impact and the “powers that be” listened. We need to repeat this effort, this time with Joan Trice. Tell Joan and the CRN the problems you see and share your thoughts as to how they could be and should be addressed, with new regulations, or modifications to existing ones, better forms, systems and accountability for all. how you feel and give her and the CRN the chance to hear what you have to say. If the NHAB really has a “blueprint for change”, let us make sure to include them and all the others in the plan. GUEST AUTHOR: Patrick Egger is a Certified General Appraiser located in Las Vegas, NV. He teaches continuing education classes on the housing market, appraisal issues for real estate agents and appraisers. He can be reached at lvreqa@cox.net Look for the new Outside The Boxes category for a collection of Patrick's articles on Appraisal Scoop! GUEST POST: Nancy Summers, Certified General Real Estate Appraiser and AQB Certified USPAP Instructor in the San Jacinto, CA area. Nancy's real estate appraisal blog is "Ground Up"
"This is a summary of a formal needs analysis* I conducted in March and April 2012 regarding the problem of appraisers continuing to violate the Uniform Standards of Professional Appraisal Practice (USPAP) and receive reprimands and enforcement actions. * A needs analysis is a formal analysis of a problem to determine if it could be solved by instruction. or even an attitude about the appraisal profession. I prepared a needs analysis by obtaining additional information from two separate survey sources, an online survey of appraisers, and a set of personal interviews of instructors and officials. The results of the interviews and surveys were analyzed and summarized here, with recommendations for possible instructional solutions and further study". Appraiser Survey The survey included three multi-part questions. The first question asked respondents to agree or disagree with several statements about USPAP concepts and the current USPAP education requirement. Respondents were also given a choice to select “I don’t understand the question.” These statements were provided to gauge appraisers understanding of key concepts in USPAP and to determine if they believe the current USPAP courses are working. As can been seen in Graph 1, the majority of appraisers completing the survey agree with all statements. The largest number of appraisers indicated that they understand how the appraisal process presented in USPAP fits into appraisal practice, as the individual standards rules in USPAP present a clear process for completion of an appraisal. However, one appraiser who also identified himself later as a USPAP instructor, disagreed with the statement and made a point to indicate that USPAP does not include an appraisal process. This confirmed that there may be variety of interpretations of USPAP even among instructors. The second question asked respondents to identify, from a list of training possibilities in the past that would have been more likely to produce a higher comfort level with USPAP today. The respondents were able to select multiple answers as well as provide additional responses. As indicated in Graph 2, most appraisers did select multiple responses, although respondents were also provided with “I’ll never feel comfortable with USPAP” and “I’m already comfortable with USPAP” selections. The majority of the responses (57%) indicated that they would feel more comfortable with USPAP today if it were integrated into other continuing education courses. Another popular choice was if USPAP were integrated into the basic principles cases, with others believing if USPAP were taught by their mentor during apprenticeships they would feel more comfortable. The third question asked of the appraisers is how USPAP would best be taught. As presented in Graph 3, the highest percentages of selections were small, live classes with 5 to 10 students maximum and integrated with other material (rather than a standalone USPAP class). Another popular selection was larger live classroom. Both independent study and online courses received the least number of selections, with respondents indicating that appraisers benefit from class discussions. Both those selecting smaller class size and those selecting larger class size each indicated an increased willingness by participants to share in discussion as a reason it is superior. To read the FULL post by Nancy Summers, visit her blog by clicking here. Thanks to Ann O'Rourke (Appraisal Today) for highlighting this article. Nice Guys Finish LAST! Clients file complaints after getting appraisers to "Second Guess" their own appraisals. T.J. McCarthy, of T.J. McCarthy & Associates, Tinley Park, IL has the following assessment of the AMC and Lender practice of making post-closing calls to appraisers to question how some of the adjustments were made and get appraisers to second-guess their original appraisal process. 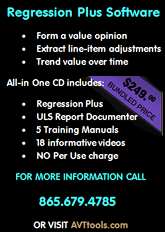 The following is being reprinted from an Illinois Coalition of Appraisal Professionals (ICAP) alert. I am writing to our residential members regarding a growing problem that ICAP is concerned with regarding lenders and AMC’s filing complaints against appraisers. FAST FORWARD: A month later you receive a letter from the Department of Professional Regulation – Appraisal Division. Your great client filed a complaint against you stating that you openly admitted to them in a phone conversation that you falsely inflated the value of your appraisal by using inappropriate site adjustments. You also stated that you often use non-traditional data sources to intentionally report market trends that are lower than normal to arrive at higher value conclusions. YIKES!! THE REALITY OF THE SITUATION: This is really happening to appraisers and since the Dodd-Frank Act more and more lenders and AMC’s are sending in complaints on appraisers. MORAL OF THE STORY: There is no question that the appraiser is getting slammed here for trying to be a “stand up” guy, attempting to clear up gray areas in their report. They’re engaging in what they perceive to be an honest dialogue with the QC department (long after the loan has been funded). Unfortunately, at the post-closing stage, the lender isn’t looking for you to have a change of heart on your final opinion of value. There are no changes that should be made, but now you have given the QC department ammo for a state complaint. Also, you should never change parts of your appraisal because you think it will make your client happy. They don’t drive the process. Perhaps you don’t even realize that you are giving someone a reason to file a complaint against you when you agree to the slightest alteration or allow someone elses opinion to dictate how you will complete your assignment. In the meantime they are on the other end of the phone writing down everything you are saying as they prepare to turn you and your report into the state. DISCLAIMER: I certainly am not telling you to ignore errors and omissions on your reports when a client discovers them and asks for corrections. Nor am I telling you to be unethical. But, by trying to be accommodating, you could be creating a problem for yourself where one never existed. I can assure you that the State of IL is receiving these types of complaints. I can’t tell you [which] lenders or AMC’s are filing these complaints. Also, I am not saying that all lenders and AMC’s support this type of practice. It’s getting pretty scary out their folks. We don’t have to make it harder on ourselves by reverting to a submissive position every time an angry client calls. We are appraisers not pacifiers! TJ McCARTHY AND ASSOCIATES, LTD.
October 13, 2011 WASHINGTON, DC—The Appraisal Foundation, a congressionally-authorized nonprofit organization dedicated to the advancement of professional valuation, announced that the 2012-13 edition of the Uniform Standards of Professional Appraisal Practice (USPAP) has been released. USPAP is the generally accepted standards of practice for the appraisal profession in the United States. The 2012-13 edition of USPAP will be valid for two years, effective January 1, 2012 through December 31, 2013. As with the prior edition, the new edition includes the standards of professional practice for all appraisal disciplines as well as guidance from the Appraisal Standards Board (ASB) in the form of USPAP Advisory Opinions and USPAP Frequently Asked Questions (FAQs). Revisions to STANDARDS 7 & 8: PERSONAL PROPERTY APPRAISAL, DEVELOPMENT & REPORTING. Copies of the 2012-13 edition of USPAP are now available for purchase via the Foundation Store at http://www.appraisalfoundation.org/. The 2012-13 edition of USPAP is available in printed, spiral bound copy for $75 and the electronic PDF download for $60. In the coming weeks, USPAP will be available in Flipbook format and for eReaders including the iPad, Kindle, Nook and the Sony Reader. About The Appraisal FoundationThe Appraisal Foundation, a Congressionally authorized non-profit organization established in 1987, is dedicated to the advancement of professional valuation. The Foundation accomplishes its mission through the work of its three independent Boards: the Appraisal Practices Board (APB), the Appraiser Qualifications Board (AQB) and the Appraisal Standards Board (ASB). More information on The Appraisal Foundation is available at www.appraisalfoundation.org. To verify or not to verify? There is no question. To verify is to establish the truth, accuracy, or reality of something. Verified information is fact. The 2010-2011 Uniform Standard of Professional Appraisal Practice [USPAP] Standards Rule SR 1-4 says the real property appraiser must verify all information necessary for a credible result. SR 1-4 encapsulates a substantial portion of the USPAP scope of work requirements for real property appraisal and implies techniques about which volumes are written. The rule is loaded with terminology that an appraiser must understand in order know whether he or she is complying with USPAP, but for now I am focused on to verify. What is verification? Verification is an activity an appraiser must undertake in development of the appraisal and it means that the information the appraiser uses in analysis is fact. Does that theme have a bearing on how the appraiser goes about verification? If the appraiser were confirm the address by calling the client back and asking is there a chance for error? Would it be better to check out the address with a reliable independent source such as the public record? The way an appraiser chooses to go about verifying information can build assurance that the appraisal is NOT MISLEADING. Most of us have had assistance from a home owner during inspection and may have heard that the house down the street sold for such and such. Let’s say you were well prepared for the inspection and you have information from the MLS that the house down the street did indeed sell for that price. But then, you notice that the MLS listing says all of the furniture and a hot tub is included in the price and that the house sold for the full listing price. Is the price verified by the comparing the home owner and the MLS? Technically yes, but there now additional information that you have that is unverified and you have a potential adjustment to the price for the furniture and hot tub. If the sale is information necessary to a credible result and you neglect to verify whether the value of the furniture and hot tub was included in the transaction price your appraisal may be MISLEADING. Appraisers often maintain that the information they use is error free. Does SR 1-4 permit the appraiser to use information without verification? Can I use information that I tried to verify but could not confirm? Is an extraordinary assumption as reliable as a fact? Is verified information more reliable for use in appraising than unverified information? If clients won’t pay me enough to take the time to verify how much time should I spend verifying information? Harvey S. Jacobs, real estate lawyer in the Rockville office of Joseph, Greenwald & Laake, wrote the following in his Washington Post article - A common-sense way to mend the draconian appraisal process . "If federal regulators are truly concerned about the quality and independence of home appraisals - a cornerstone of sound mortgage lending - why don't they simply prohibit appraisers from learning the contract price before they perform their assessment of a home's value? Instead of this commonsense solution, regulators continue to come up with schemes that govern how appraisers are chosen - and which simultaneously drive up prices to consumers while cutting the income of appraisers. ﻿On April 1, a new regulatory scheme called Appraiser Independence Requirements, will go into effect. This AIR replaces the much-maligned Home Valuation Code of Conduct but does little to improve it. Both AIR and HVCC were designed to ensure that the home valuation process conducted by appraisers is conducted in a strictly independent manner. Unfortunately, in practice AIR continues the legacy of HVCC, causing borrowers to pay more for their appraisals and appraisers to earn less for their work." While the article does a very good job of chronicling the history of the HVCC, AMCs, and the AIR, I'm not so sure that his answer to the problem will solve all of the problems that he thinks it will. For one thing, it assumes that all mortgage appraisals done for lenders result from sales. What about the gazillions of refinance appraisals for which there are no "contract prices"? Without access to the contract, how would the appraiser be able to learn ALL of the terms, conditions, and concessions involved with the sale? Doesn't USPAP require appraisers to view and analyze the current contract? Does the author REALLY think that the contract is the only place that appraisers would learn the sales price? Even IF the sales price were to be redacted from a contract, don't you think that the buyer, seller, agent or someone involved in the transaction would let that figure "slip"? Wouldn't it be BETTER to have something that actually documents the factual sales price? What do YOU think of this author's fix to the "draconian appraisal process"? It seems as though a recent trend with some clients (primarily AMC’s) has been a concern over the appraiser’s ability to work in certain markets. After all, if we have never or rarely worked in a specific locale then obviously we are not qualified to work there; right? Well before jumping directly into USPAP we should clear up some things. The reason why this is a growing trend is most likely due to the level of complaints lenders and AMC’s are receiving about “low” appraisals. Homeowners and realtors have been concluding that appraisals are coming in under the true value because the appraiser was not from the area or did not know the market. In fact, many of my own realtor friends have largely based their stand against HVCC on this argument and I have consistently stated my opposition to this line of logic. There are numerous strong points against HVCC but geographic competency is not one of the stronger ones. If geographic competence was really a growing issue, realtors and homeowners must realize that it would not only be reflected in under-valued appraisals but inflated ones as well. A lack of competence in any market will always lead to erroneous and unreliable reports. In my opinion, HVCC has not been a good policy but I don’t believe it has caused a rise in the number of appraisers working in unfamiliar territories. Of course some rogue appraisers do occasionally violate the requirement to be knowledgeable in whatever market they are completing appraisals but no significant pressure to do this was brought about by HVCC alone. Rather than discussing the finer points of this debate, we do have a binding requirement that is literally recorded in black and white. The Competency Rule of USPAP is very clear on this issue. describe the lack of knowledge and/or experience and the steps taken to complete the assignment competently in the report. Notice that it does not define competency by distance or a mile radius as is the growing standard requirement on some AMC requests. Some clients define the distance by the office location and some by where the appraiser lives. Both are faulty in premise and do not adequately qualify or disqualify the appraiser for an assignment. Conversely, just because an appraiser lives or has an office in a specific market does not automatically mean they are qualified to complete appraisals there. Many appraisal firms have expertise in numerous markets that may or may not be contiguous to their place of business or homes. Some may have qualified appraisers who specifically cover distant regions. For instance, our company has been working in a satellite market that is forty miles from our office and has been doing so for over fifteen years. We have weekly assignments there and are also members of that areas MLS and are well-known by many of the area realtors. Chances are that if an appraiser pays to be a member of an MLS, then they probably do enough work there to justify the ongoing expense. Some commercial appraisers do work for retail chains in different States and in addition to their individual State Certifications; they are bound by the same USPAP Competency Rule. Even in cases where an appraiser does not have the experience and knowledge, USPAP allows and requires that they become sufficiently knowledgeable to complete an assignment. Obviously the bigger debate would then be what the process is for obtaining that knowledge. The Competency Rule does propose several methods to accomplish this but it does not spell out an absolute protocol. If the trend of distance requirements continues to increase, it is possible that many affected will simply look for new ways to widen their coverage area. What is to stop appraisers from creating additional branch locations and re-registering those addresses with AMC databases? One-appraiser and home office operations who represent the largest segment of our industry could really feel a pinch if this happens. Until then, it is probably a good idea to have a statistical database of assignments to support your qualifications claims. Appraisal Independence at Crossroads, Again!